I changed it up slightly. Bobby had debossed the background iris, where I used a white die-cut. And I used distress inks to watercolour my iris, instead of Brushos. Thanks so much Bobby for the inspiration! I die-cut the iris from both watercolour paper and white card stock. As I mentioned, I used distress inks to watercolour my iris and then layered it over top of the white die-cut in the background. A simple stamped sentiment and a few sequins for sparkle and the card was done. I hope you'll find some time to check out Bobby's blog ... I know you will have fun there! 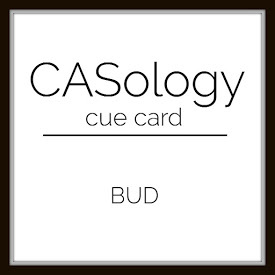 I'm playing along with the latest CAS-ology challenge - Bud. Your iris is so pretty Loll. Lovely card. beautiful!!! love the simplicity and the iris colors - very classy! This is such an elegant card, Loll. Beautiful! Now I will have to CASE your card! In a word, gorgeous!! Love how you CASEd it. Enjoy your day! Loll, this is gorgeous and I love the way you've layered the flower! Thanks for playing along with CASology this week! What a beautiful take on her card! I love the iris and the outstanding job you did shading those petals. This is SO gorgeous, Loll! Love the idea of the white die cut behind it too. Wonderful use of the iris die, Loll. Mine is still in my NBUS box so should pull it out for Darnell's upcoming challenge. Love the way you layered it twice and the gorgeous colours you used. Love Bobby's card and I am sure she will be thrilled with your beautiful CASE, Loll. 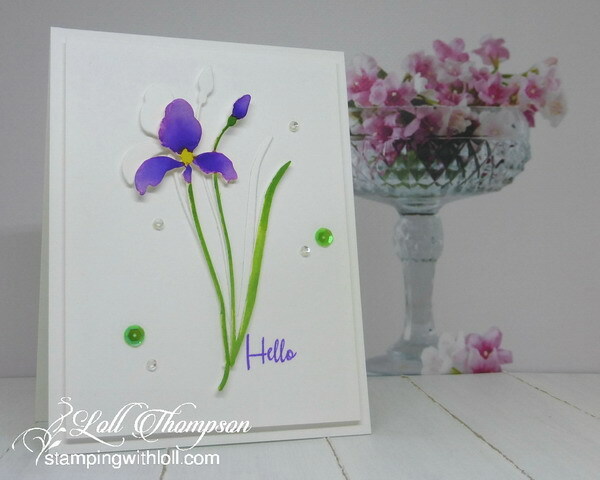 I love the simplicity of the CAS design, your watercoloured die cut iris and pretty sequins. TFS my friend. A wonderful CASE of Bobby's card, Loll! 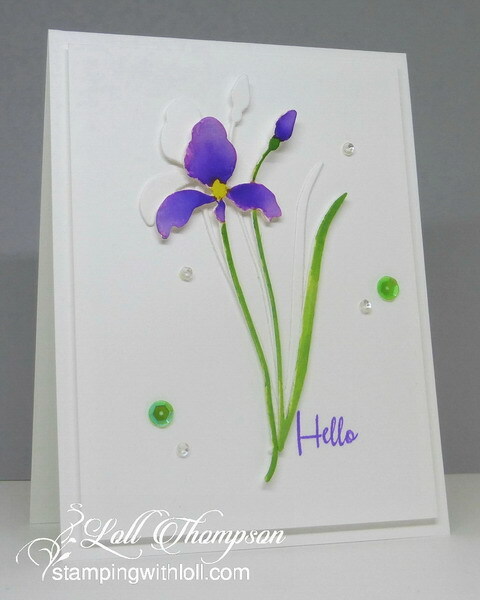 I love this iris and the white die cut behind it adds so much depth! Awesome, my friend! The white background die is great behind the coloured version of the die. Love this, Loll! Your watercolouring is absolutely beautiful. Love the white die cut behind. Absolutely love the offset die - wonderful idea. Beautiful colouring. So happy you could join in the CASology challenge this week. Your iris is exquisite. I love the white die cut behind it. Loll, what a lovely CASE of Bobby's card...I love that offset image and white die. Just lovely! Thanks for playig along at CASology! Such a VERY beautiful result. This looks beautiful, Loll (and makes me want to get that die)! How clever to switch the debossing to a white die cut! Congrats on your shout out at CASology for this gorgeous card, Loll! I love the beautiful colors you chose for your Brushos...so striking, and the clever white die cut behind your focal image is perfect! Wonderful iris flower. With admiration I look at how you added colors, as beautifully shaded flower petals. Adding a white shadow is a brilliant solution, adding expression to the card. Why am I just seeing this now, Loll? I knew I was behind in viewing my emails and I have been going back and commenting but I must have skipped over this one. Thanks so much for the shout out,my friend, and for CASEing my card. I'm glad I could inspire you for once as you continually inspire me. How's this for ironic? You CASE my card for the CASology challenge and I end up winning with my card. This is simply beautiful. Thank you for sharing the details and the link to Bobby's beautiful card.